At Capitol Reef National Monument, Utah, the Civilian Conservation Corps (CCC) worked tirelessly to build roads making this remote area accessible for visitors to the National Monument. In 1937, President Franklin Roosevelt designated 37,711 acres of land in Utah as Capitol Reef National Monument. The new monument was under the jurisdiction of Zion National Park until becoming its own National Park in 1971 under President Richard Nixon. The area was also expanded to 241,000 acres, a very considerable increase in size. However, during the New Deal era of the late 1930s to early 1940s Capitol Reef was simply a small National Monument, remote, with very little infrastructure. Members of the Civilian Conservation Corps camp NM-2 (later renamed NP-6) took on the task of bringing improving infrastructure in the Monument. These men were based west of Fruita, close to Chimney Rock. Much of what the CCC men built remains visible within Capitol Reef National Park. Two examples of this are the Fruita ranger station and a powder magazine built into the hillside. The CCC constructed the powder magazine to store the large supply of explosives they needed to quarry sandstone slabs for construction of roads, trails, and buildings within the monument. It is now listed on the National Register of Historic Places and can be seen by the many people who visit Capitol Reef. 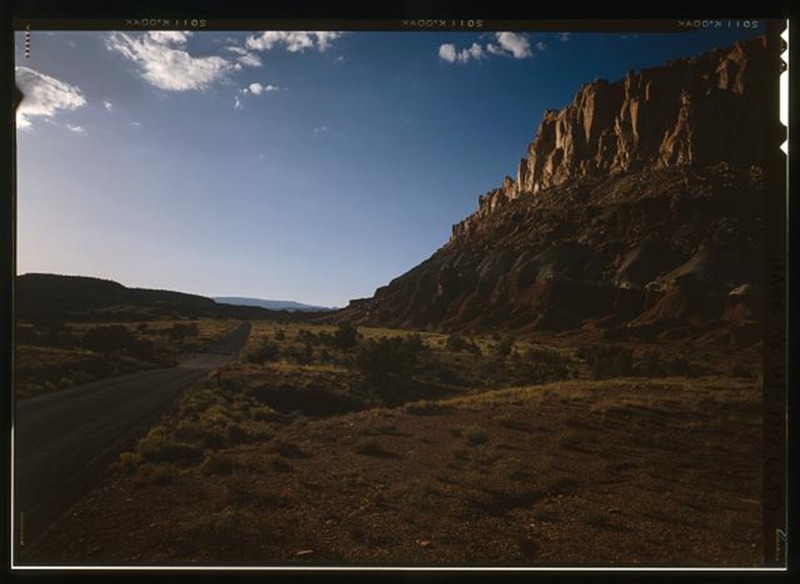 One of the roads built by the CCC to increase access to Capitol Reef National Monument and the surrounding area was the Torrey-Boulder Road, which allowed access to the isolated town of Boulder for the first time. Except for a few scattered lodges and the small Native American population of Havasupai in the Grand Canyon, Boulder had been the last place in the United States to receive its mail by mule—as late as 1940. 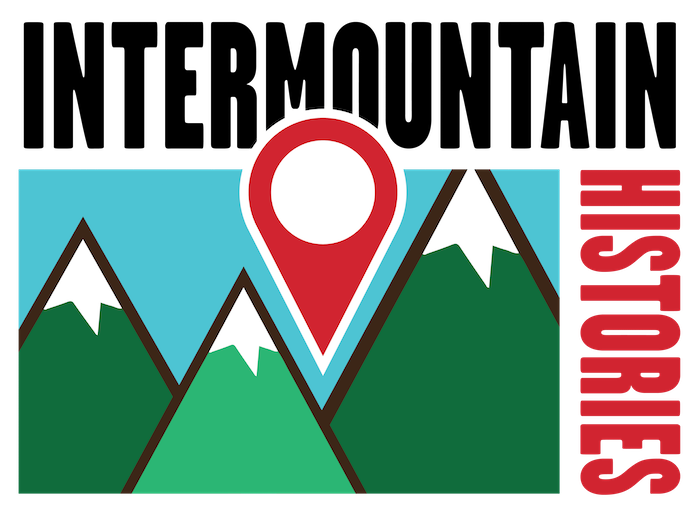 The road built by the CCC climbs up to 9,000 feet at points, winding its way through thick forests of Aspen and is now a part of Highway 12. The CCC built two similar roads in the area which are colloquially referred to as ‘The Million Dollar Road’ and ‘Hells Backbone Road’, names which imply their construction difficulties. Torrey-Boulder Road: Torrey-Boulder Road stretching into the horizon. ~ Source: Capital Reef National Park Roads & Bridges, Along State Route 24 between Torrey & Cainesville, Torrey, Wayne County, UT. Boulder Town Garfield County Torrey Utah Wayne County, 1968. Documentation Compiled After. Photograph. Retrieved from the Library of Congress, https://www.loc.gov/item/ut0409/ ~ Creator: Historic American Engineering Record, Creator, and Civilian Conservation Corps, Grogan, Brian C, photographer. 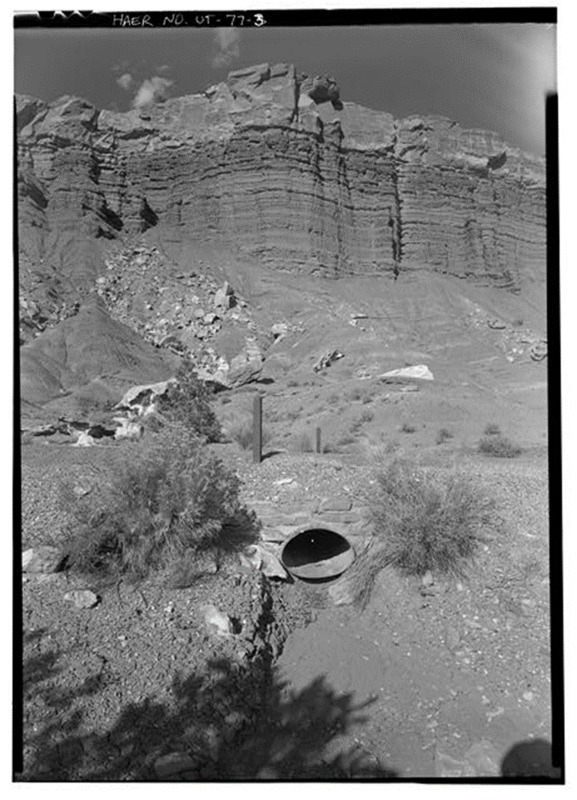 Culvert at Capitol Reef: A culvert put in place by the CCC at Capitol Reef National Monument. ~ Source: Capitol Reef National Park Roads & Bridges, Along State Route 24 between Torrey & Cainesville, Torrey, Wayne County, UT. Boulder Town Garfield County Torrey Utah Wayne County, 1968. Documentation Compiled After. Photograph. Retrieved from the Library of Congress, https://www.loc.gov/item/ut0409/ ~ Creator: Historic American Engineering Record, Creator, and Civilian Conservation Corps, Grogan, Brian C, photographer. Chimney Rock: Chimney Rock, near the site of CCC camp NM-2. ~ Source: Chimney Rock, Capitol Reef National Park, Utah. Capitol Reef National Park United States Utah, None. [Between 1980 and 2006] Photograph. Retrieved from the Library of Congress, https://www.loc.gov/item/2011630111/ ~ Creator: Highsmith, Carol M, photographer. 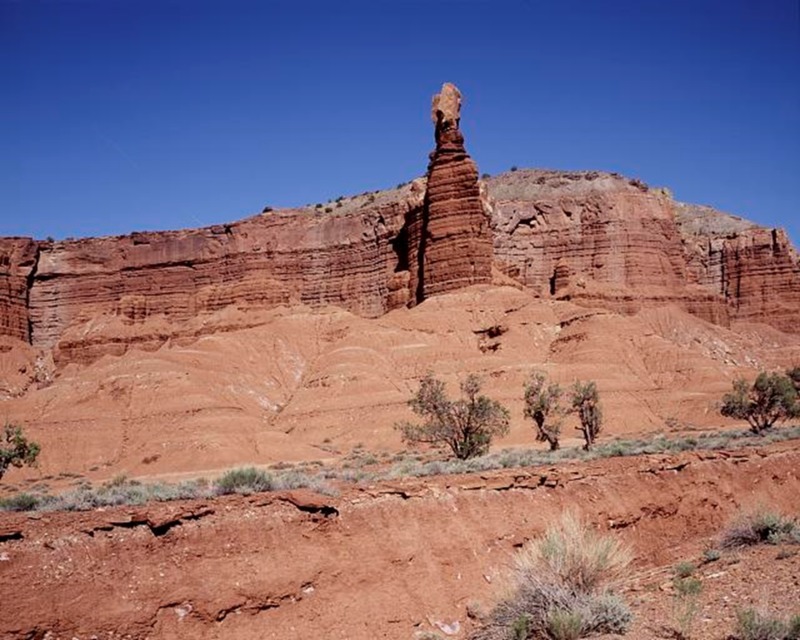 Sarah Birt, Northern Arizona University and Hull University , “The CCC & Capitol Reef National Monument,” Intermountain Histories, accessed April 19, 2019, https://www.intermountainhistories.org/items/show/73.